Dates and raisins are dried fruits that can pack quite a nutritional punch. While high in calories compared to fresh fruit, both dates and raisins supply a significant amount of certain vitamins and minerals. If you enjoy these dried fruits as a part of your regular diet, you may be interested to compare the nutritional differences to help you determine which earns a more frequent spot in your menu. Protein is an essential nutrient that helps give your body energy. If you find you lack energy at certain parts of the day, adding a high-protein snack may help combat fatigue and sluggishness. Raisins and dates, though high in calories, also supply a healthy dose of protein. A 1/4 cup serving of raisins contains 1.27 g of protein. 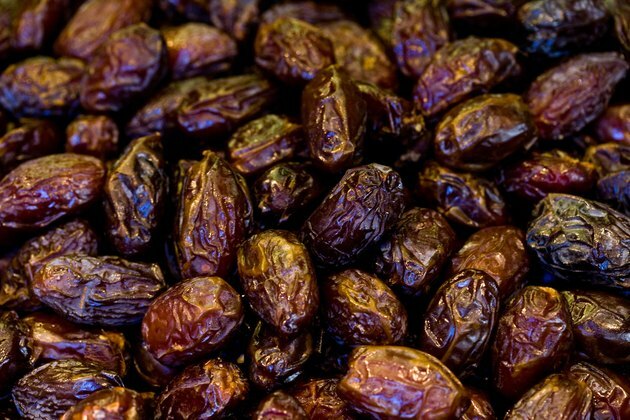 A 1/4 cup serving of dates has about 0.9 g of protein. You get a hefty dose of fiber from both raisins and dates. Fiber helps support your digestive system so it works more efficiently. A high-fiber diet has been shown to help reduce your risk of constipation by encouraging your body to expel waste regularly. The Harvard School of Public Health notes that increasing the fiber in your diet may also help cut your risk of certain chronic health conditions, including heart disease and certain types of cancer. A 1/4 cup serving of raisins contains 1.52 g of fiber. The same portion of dates contains 2.95 g.
Dates and raisins are each a healthy source of certain B vitamins. B vitamins help you turn your food into energy. A 1/4 cup serving of raisins supplies 0.316 milligrams of the 14 to 16 milligrams of niacin you need each day, and 0.035 milligrams of the 1.1 to 1.2 milligrams of riboflavin you need daily. The same portion of dates supplies 0.467 milligrams of niacin and 0.024 milligrams of riboflavin. A 1/4 cup of raisins supplies about 2 micrograms of folate, a B vitamin that may prevent certain birth defects. The same amount of dates supplies 7 micrograms. You also get a small dose of vitamin C from a serving of raisins or dates. A 1/4 cup serving of raisins provides you with 0.77 milligrams of the 8 to 18 milligrams of iron you need each day, 20.5 milligrams of the 1,000 milligrams of calcium you need daily and 309 milligrams of 4,700 milligrams of potassium you need each day. The same amount of dates supplies you with 0.37 milligrams of iron, 14.25 milligrams of calcium and 241 milligrams of potassium.